A Colombian national pleaded guilty yesterday in connection with his role in a bribery scheme that resulted in the dismissal of a drug trafficking indictment filed against a Colombia-based cocaine trafficker from the Cali Cartel, announced Acting Assistant Attorney General Kenneth A. Blanco of the Justice Department’s Criminal Division. According to admissions in the plea agreement, Juan Carlos Velasco Cano, 49, acted as an intermediary between U.S. Immigration and Customs Enforcement (ICE) Homeland Security Investigations Special Agent Christopher V. Ciccione II, 52, of Phoenixville, Pennsylvania, and Colombian national Jose Bayron Piedrahita Ceballos, 58. Ciccione used his official position to cause a drug trafficking indictment against Piedrahita to be dismissed and to obtain official authorization for Piedrahita to enter the United States. Velasco admitted that Piedrahita gave Ciccione approximately $20,000 in cash, dinner, drinks and prostitution during an extended hotel stay in Bogota, Colombia in exchange for Ciccione using his official position to obtain the dismissal of the indictment against Piedrahita. In furtherance of the scheme, Velasco arranged for a meeting of the conspirators in Bogota, Colombia; facilitated communications between Piedrahita and Ciccione; and received confidential law enforcement information from Ciccione about himself and others, including the names of a confidential source and cooperating witnesses. Velasco will be sentenced on Jan. 17, 2018 before U.S. District Judge Robert N. Scola Jr. of the Southern District of Florida. Ciccione is pending trial and Piedrahita is currently incarcerated in the Republic of Colombia. ICE’s Office of Professional Responsibility, Department of Homeland Security’s Office of Inspector General and the FBI investigated the case. The Criminal Division’s Office of International Affairs, the Office of the Judicial Attaché in Colombia and the Drug Enforcement Administration provided valuable assistance to the investigation. The Colombian Attorney General’s Office also provided invaluable support. Trial Attorneys Luke Cass and Jennifer A. Clarke of the Criminal Division’s Public Integrity Section are prosecuting the case. Law enforcement needs the public’s eyes and ears to help keep the country safe. If you see something suspicious, please contact the FBI at tips.fbi.gov. 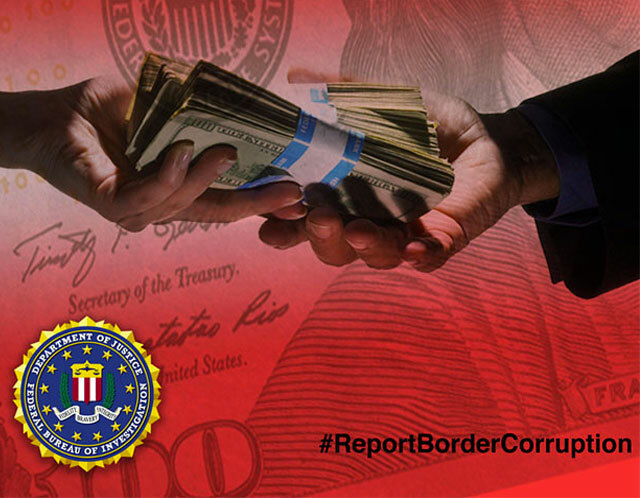 Law enforcement encourages citizens and government employees who witness or suspect border corruption to report it to their local FBI field office. Among the FBI’s top priorities is public corruption, which includes border corruption. Border corruption poses a significant risk to national security and can be challenging to detect due to the number of people who cross the border every day. Drug trafficking, human trafficking, and terrorism are potential threats facing the United States based on the underlying threat posed by border corruption. The FBI’s Los Angeles Field Office is one of 11 FBI offices participating in the border corruption campaign whose area of responsibility includes U.S. ports of entry, such as border crossings, airports, and seaports. The other cities are Albuquerque, New Mexico; Buffalo, New York; Detroit, Michigan; El Paso and San Antonio, Texas; Fargo, North Dakota; Los Angeles and San Diego, California; Miami, Florida; Phoenix, Arizona; and Seattle, Washington. “When government officials responsible for border security engage in corruption, they leave us vulnerable by creating an environment where criminal activity thrives and threatens our national security,” said Danny Kennedy, the Assistant Director in Charge of the FBI’s Los Angeles Field Office. Every day, over a million people visit the U.S. and enter through airports, seaports or one of more than 300 official ports of entry to the U.S. The federal government also protects nearly 7,000 miles along the U.S. border and 95,000 miles of U.S. shoreline. “The national security threat posed by drug trafficking is multi-faceted—more than 140 drug overdose deaths occur each day in America, and our communities suffer countless other damages at the hands of violent criminal organizations responsible for the flow of illegal drugs onto our streets,” said DEA Los Angeles Special Agent in Charge David J. Downing. The FBI and our local law enforcement partners and federal parters at the DEA, TSA and CBP investigate government officials who accept bribes in exchange for documents or sensitive information. They also investigate those who facilitate the admission of unauthorized people or contraband to the U.S. These corrupt practices may enable the entry of explosives or other hazardous materials across our border, may facilitate human trafficking or drug smuggling, or may allow terrorists or other criminals into the U.S. If you see something suspicious, please contact the FBI at tips.fbi.gov. “Promoting the integrity and professionalism of the U.S. Customs and Border Protection (CBP) workforce is critical to successfully accomplish our national security mission,” said Jeffrey C. Green Special Agent in Charge CBP Office of Professional Responsibility (OPR) in Los Angeles. The FBI leads 22 border corruption task forces and working groups across the country comprised of 39 local, state, and federal partner agencies, including U.S. Customs and Border Protection, the Drug Enforcement Administration, and the Transportation Security Administration. More than 250 officers are conducting investigations and gathering intelligence to stop public corruption along all U.S. ports of entry. Below are examples of border corruption investigations investigated locally. An immigration service officer with U.S. Citizenship and Immigration Services (USCIS), Mai Nhu Nguyen, 48, who took thousands of dollars in bribes from immigrants who were seeking either citizenship or lawful permanent resident status in the United States was sentenced to 30 months in federal prison. From 2011 through June 2013, Nguyen solicited and took bribes from Vietnamese immigrants. In one case, Nguyen took $1,000 from an immigrant seeking a “Green Card” and 200 egg rolls from an immigrant seeking citizenship. Nguyen, who worked at USCIS’s Santa Ana office for approximately eight years, was an immigration service officer with the power to approve or deny applications for immigration benefits that are submitted by immigrants. The case against Nguyen is the product of an investigation by the Federal Bureau of Investigation and the Department of Homeland Security’s Office of Inspector General. A former immigration services officer with U.S. Citizenship and Immigration Services (USCIS) who had the power to approve applications for citizenship was sentenced to 33 months in federal prison for taking tens of thousands of dollars in bribes. Daniel Espejo Amos, 68, of Lakewood, pleaded guilty to one count of conspiracy and one count of being a public official who accepted cash bribes. When he pleaded guilty, Amos admitted that he accepted more than $53,000 in bribes from immigration consultants on behalf of immigrants who were not eligible to become naturalized United States citizens. A senior attorney with U.S. Immigration and Customs Enforcement (ICE), Constantine Peter Kallas, 40, of Alta Loma, was sentenced to 212 months in federal prison for taking nearly one-half million dollars in bribes from immigrants who were promised immigration benefits that would allow them to remain in the United States. Law enforcement needs the public’s eyes and ears to help keep the country safe. If you see something suspicious, please provide that information to the FBI at tips.fbi.gov. In Los Angeles, the FBI may be reached 24 hours a day at 310 477-6565. Reward money may be available in exchange for valuable information that leads to an arrest. Confidentiality is guaranteed.